Born in Athens in 1978, Angelos Bratis grew up in his seamstress mother’s atelier before enrolling at the Veloudakis Fashion School in Athens. He gained his master’s degree at ArtEZ Institute of the Arts, formerly known as the Arnhem Fashion Institute, in Amsterdam. He then worked as an assistant to Couture Houses in Paris and Rome until his return to Greece in 2005 to establish his own design studio. The financial crisis and ensuing recession forced the designer to leave his hometown behind once again. He returned to Italy where he acted as consultant designer for brands such as Vionnet and Roberto Cavalli, while continuing to present his eponymous collections. In 2011, the designer’s career and renown were boosted when he won the “Who Is on Next?” competition, founded by Vogue Italia’s Franca Sozzani and designer Silvia Venturini Fendi and AltaRoma. In September 2014, Bratis was selected to present his ss15 “Moralis” collection in the Teatro Armani, fashion maestro Giorgio Armani’s Milanese headquarters designed by Japanese star architect Tadao Ando. Angelos Bratis’ fluid silhouettes and signature drapes set a new mood of elegant ease. His collections have over the years, graced catwalks in Milan, Paris, Amsterdam, Athens, Beijing and New York and have garnered great attention from the international press. 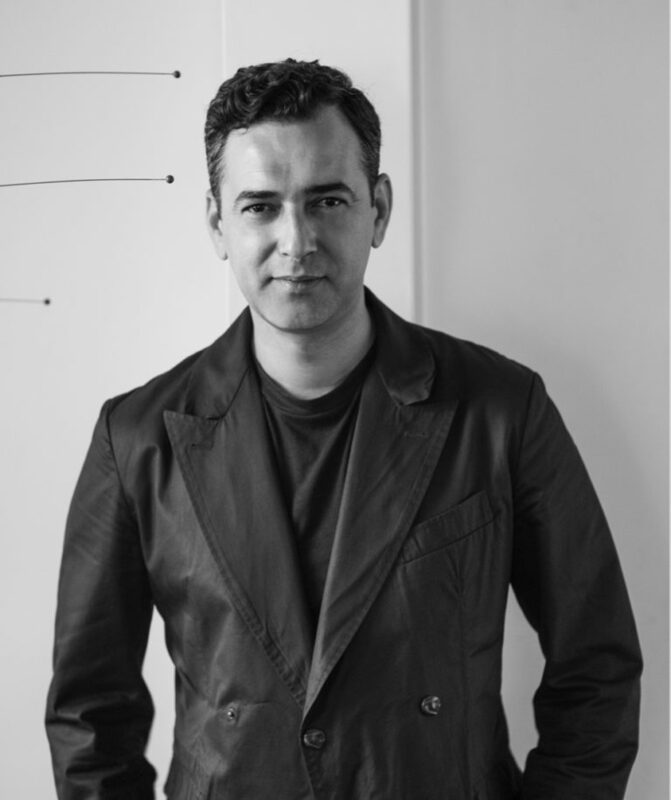 He has collaborated on special projects with brands such as Yoox.com, L’Oreal Paris, Wella Professionals, Mattel’s Barbie, Johnnie Walker Black Label and Harris Tweed among others. Give Angelos Bratis the plainest piece of fabric and in no time it’ll be transformed into a draped wonder. He is an intuitive dressmaker. Bratis is a technician. He doesn’t work on themes, instead relying solely on the possibilities of ingenious draping and a bias cut to build his creations. The clothes, made in wool and silk, constructed with a single seam, were as virtuoso as it can get, flowing and coiling around the body with natural ease. Con la cultura innata del pelo sa arricciare e tagliare abiti senza una cucitura, con pieghe e forme di grandissima classe. “I take materials and through cutting make them seem floaty,” said the designer, who made what often requires years of training seem so wearable, so elegant and so easy.